Hamas Islamic Resistance - How much Palestinian land do Israeli settlements really eat up? 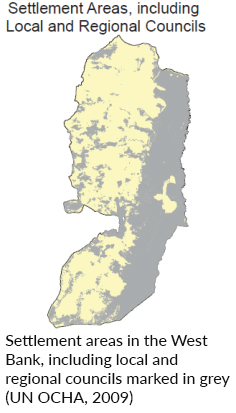 How much Palestinian land do Israeli settlements really eat up? So is this true – and exactly how much of the Occupied Palestinian Territory (OPT) do Israel’s settlements take up? 1. What the 2 percent figure omits. 2. The settlements’ local authorities. Israeli NGO B’Tselem, meanwhile, describing how Palestinians are prevented from using land in ‘Area C’ (around 60 percent of the West Bank), states that settlements and their regional councils constitute 36.6 percent of the West Bank as a whole. 3. A little land goes a long way. The amount of land taken up settlements – as well as their accompanying infrastructure – is not just a matter of square hectares; it is possible to colonise key natural resources, and control and fragment occupied territory, by settling a proportionally small amount of land. 4. All settlements are illegal under international law. There is, of course, a fundamental point missed by a debate over percentages. Every single one of the more than 200 Israeli settlements in the OPT – some ‘official’, others ‘unofficial’ – are illegal under international law. This is a view shared by, among others, the United Nations (including in both Security Council and General Assembly resolutions), and the International Court of Justice. The Israeli government itself was given legal advice in 1967 that civilian colonies in the OPT would be a violation of the Fourth Geneva Convention – but proceeded nonetheless. And every single Israeli prime minister since has maintained, consolidated, and expanded, these illegal settlements. 5. Settlements are inherently discriminatory. This is a daily reality long attested to by Palestinians, as well as by Israeli groups, diplomats, and global human rights NGOs. Thus, regardless of their relative size, or even their future fate in a peace deal, Israel’s settlements in the West Bank, today, constitute a grave, systematic violation of international law and human rights. They are part of an apartheid system. Ben White is the author of Israeli Apartheid: A Beginner’s Guide and Palestinians in Israel: Segregation, Discrimination and Democracy. He is a writer for Middle East Monitor, and his articles have been published by Al Jazeera, al-Araby, Huffington Post, The Electronic Intifada, The Guardian’s Comment is free, and more.